Stay on top of all that is going on across your contact centre through smart quality monitoring features, allowing you to optimise agent performance by monitoring calls and tracking agent behaviour in real time. Assess training and coaching opportunities, using your findings to develop agent performance and drive results. Oversee agent performance through intelligent call and quality monitoring, helping you reward high performing agents or identify those in need of coaching to maximise contact centre efficiency. Understanding exactly how your agents are interacting with customers puts you on a clear path to improving quality and performance in your contact centre. Within a couple of clicks you can be listening in to live calls and providing one-to-one in-call coaching, allowing you to give extra support to those agents in need of it and drive towards a higher standard of performance. Oversee the strengths and weaknesses in the approach of your agents’ through silently listening in to their calls as they happen live. Agents and customers will have no knowledge this is taking place, allowing you to gauge where extra training may need provided or changes in technique or tone executed. Go one step further by stepping in to a call as it’s taking place, offering instructions and guidance to agents to help them reach a successful outcome before it’s too late. Whether it’s to help push a sale on the brink over the finish line or assist a new starter, the end customer will have no knowledge you are secretly talking to your agent. Manage your team from anywhere in the world – all you need is an internet connection. This enables you to access Quvu regardless of where you are on the planet and keep tabs on the performance of your agents, whilst being extremely handy for flexible working and easily monitoring agents over multiple sites. Listen back to previous calls whenever you feel like it with an online archive that makes locating specific recordings a piece of cake. Get instant access to a database of conversations, whether they took place minutes, weeks or even years ago. Your recordings can serve a number of useful purposes, from training new agents, to monitoring quality and customer service over a considerable period of time, to even being used for compliance. 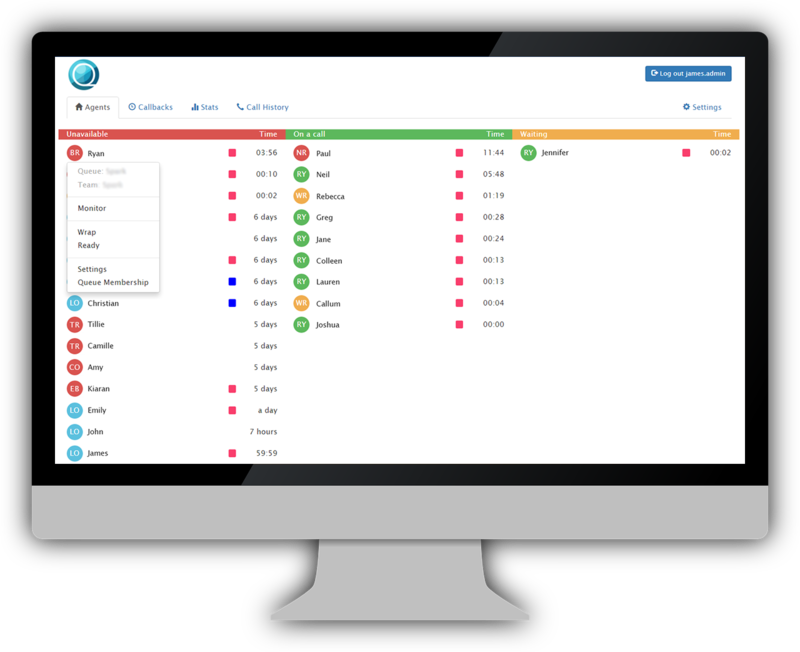 By default all calls made and received will be recorded and stored in your call history, enabling you to immediately monitor performance and quality across your entire contact centre. Recordings are stored for up to 6 years, while you can also choose to set up the automatic bulk transfer of recordings to your own server. Easily finding the recordings you’re looking is a painless task thanks to the many ways you can filter call history. Filter by customer phone number, agent, team, campaign, data source, data file, call date and even disposition. This affords you pinpoint accuracy and allows you to find recordings based on specific call outcomes. You are free to utilise recordings at your convenience. You may wish to listen directly in your web browser from wherever you are in the world; pausing, fast-forwarding and rewinding at your will. Alternatively you can download copies so you’ve got a physical backup in your local documents, which will be in .mp3 format. Agents can be given permission to pause the recording of calls as they are happening live. This ensures you stay compliant, protecting against the transmission of sensitive information. Agents simply click a button to pause the recording, before clicking again to resume it after the sensitive details have been exchanged. Our contact centre monitoring is in real-time so you and your supervisors can stay on top of what is going on, when it is going on. 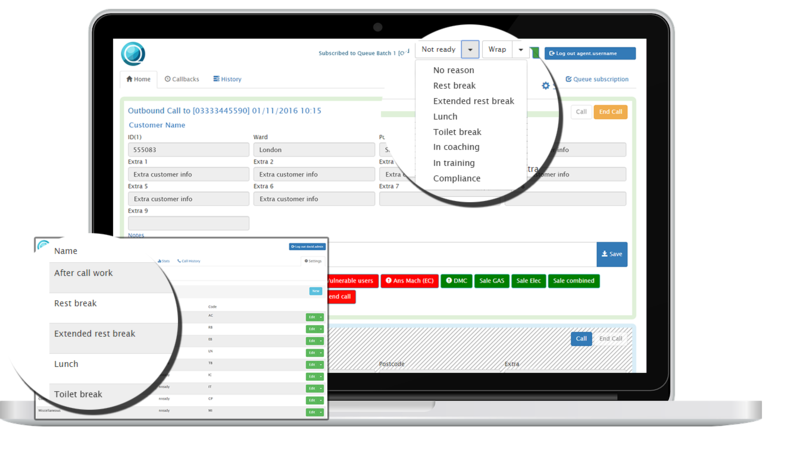 Enhanced and fully customisable tracking tools will give you a clear indication on all your agents’ current states of activity, giving you an instant overview so you understand the current state of play across your entire workforce; identifying patterns, trends and verifying quality assurance (QA). Select the individual agents, teams or campaigns you want to monitor and immediately get an overview showing the current state of each agent. Broken down into unavailable for a call, on a call and waiting for a call, each agent will also display additional information on their individual state. For example, you may see an agent not ready for their next call and on further inspection it reveals this is because they are carrying out after call work on a previous call. Enjoy the flexibility that allows you to customise as many states as you like, which agents will choose from in order to present their current state of activity. These are unlimited and can be as detailed or basic as you wish, helping you identify the reason why an agent may be not ready for a call or in wrap mode. For example, it’s useful to know that if an agent has been unavailable for a call for an extended period of time it is because they’re on a lunch break or similar. You have the power to change agent states if you deem it necessary. Simply click the agent and on the menu that appears you can change their state, without even having to give them warning. For example, if you notice an agent has been sat in not ready mode for longer than is necessary while they perhaps try to avoid taking a call, you can manually push that agent into ready mode. From the same menu Quvu also facilitates you to change the campaign an agent is enrolled on. Utilise our enhanced agent and contact centre monitoring your way. Benefit from being able to create any reason code you wish at any time, facilitating you to monitor all kinds of different agent states of activity. When an agent goes into not ready or wrap mode they will be able to select from these states that you have configured, allowing you to instantly monitor and track agent behaviour.